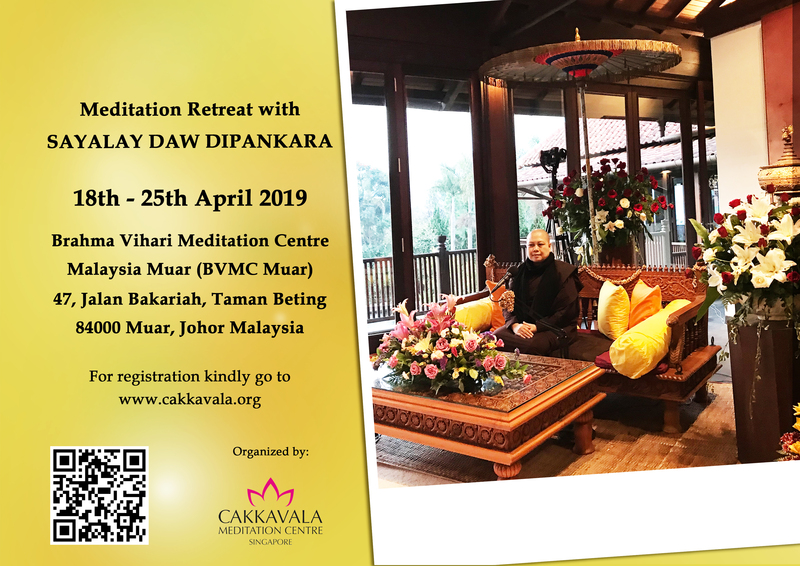 We are pleased to announce the upcoming meditation retreat with Sayalay Dipankara. Please note only online application or send in by post shall be accepted. To apply via post, kindly fill up the registration form below. To facilitate the transport of yogis to & fro Singapore - BVMC Muar, CMC will be chartering 44 seater coach at S$30/px (2 way). Kindly include your name in the transaction. For Yogis requiring Coach service, the application will only be considered completed upon payment for Coach. Retreat attendance is free of charge. We welcome and rejoice in your dana to defray the cost of running the retreat. To dana, please click here or see attachment Dana Form below. Dana for Meals & Utilities will be on a first come first serve basis upon receipt of Dana form (slow mail or online). 1) Cheque to be issued to “Cakkavala Meditation Centre” Kindly attach Dana form with cheque. Kindly include your name and under remarks, kindly state: CMC retreat Dana. For Internet Banking and ATM transfer, kindly fill up the online Dana form. We look forward to seeing you at CMC retreat 2019!